After the Civil War, the Cromwell Family moved to Elkhart in Anderson County. Finding no organized Baptist Church in the community, J.W. Cromwell decided to organize a Baptist church in April of 1886. 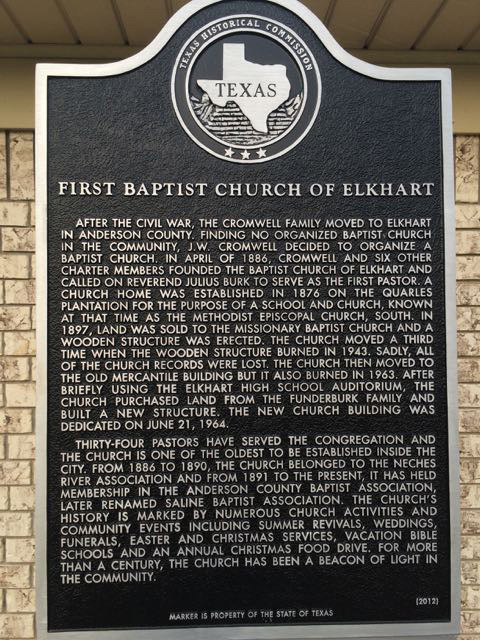 Cromwell and six other charter members founded The Baptist Church of Elkhart and called on Reverend Julius Burk to serve as the first Pastor. A church home was established in 1876 on the Quarles plantation for the purpose of a school and church, known at that time as the Methodist Episcopal Church South. In 1897, land was sold to the Missionary Baptist Church and a wooden structure was erected. The Church moved a third time when the wooden structure burned down in 1943. The church purchased land from the Funderburk Family and built a new structure. The new church building was dedicated on June 21, 1964. The Church is one of the oldest to be established inside the city. The church’s history is marked by numerous church activities and community events including Easter and Christmas services, vacation bible schools and annual Christmas food drives. For more than a century, First Baptist Church of Elkhart has been a beacon of light in the community. Our history is marked by numerous church activities and community events including Easter and Christmas services, vacation bible schools and annual Christmas food drives. Our goal is to spread the Word of God among teens in middle school to high school. We gather one hour before church each Sunday and at 6:30 PM every Wednesday. The Church is one of the oldest to be established inside the city. For more than a century, First Baptist Church of Elkhart has been a beacon of light in the community.